If downer cows are to recover, they need immediate attention. Humane care vital no matter what the expected outcome. 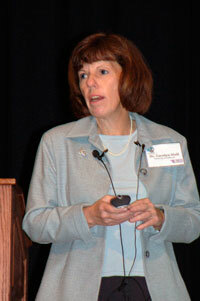 MANHATTAN, Kan. (May 21, 2010) — Carolyn Stull, an animal welfare Extension specialist with the University of California-Davis, shared management strategies for handling downer cows as she addressed participants at the International Symposium on Beef Cattle Welfare May 21. If a cow is nonambulatory for more than 6 hours and remains in the same position on concrete, due to crushing of the sciatic nerve it is highly unlikely she will recover, Carolyn Stull says, stressing the importance of taking proper care of these cows immediately. Stull has primarily worked with nonambulatory dairy cows, but many of the same management principles apply to downer beef cows as well. Stull noted that if a cow is nonambulatory — unable to get up — for more than 6 hours, it is highly unlikely that she will recover. Thus, Stull emphasized that it is important to have steps in place for dealing with downed or injured cows. 1. Conduct a physical examination to assess the cow’s suffering and get a diagnosis and prognosis. 2. If the cow is suffering or the prognosis is poor, euthanize her immediately. 3. If the cow has a chance to recover, move her to a soft surface and start treatment. Stull recommends 12 inches of sand as a surface to help the cow get traction and minimize muscle or nerve damage. Additionally, Stull emphasized the importance of not dragging a downed cow, but moving her carefully with a sled, sling or front-end loader. Providing shelter or protection from the weather is important for the care of downed cows, as well as providing feed and water that is accessible. Physical therapy is also a critical factor in the successful recovery of downed cows. Sling systems, hip lifters and flotation tanks are all available to assist with helping the cow stand and walk again. “A lot of labor goes into any of these methods,” Stull said. Stull concluded by re-emphasizing that if you are not going to take care of downed cows humanely, they need to be euthanized. “You have to train employees and it has to be done in a timely manner,” she said. For more information on handling downer cows visit www.vetmed.ucdavis.edu/vetext/animalwelfare/.